Shelley is the director of Ashtanga Yoga School of Spokane. 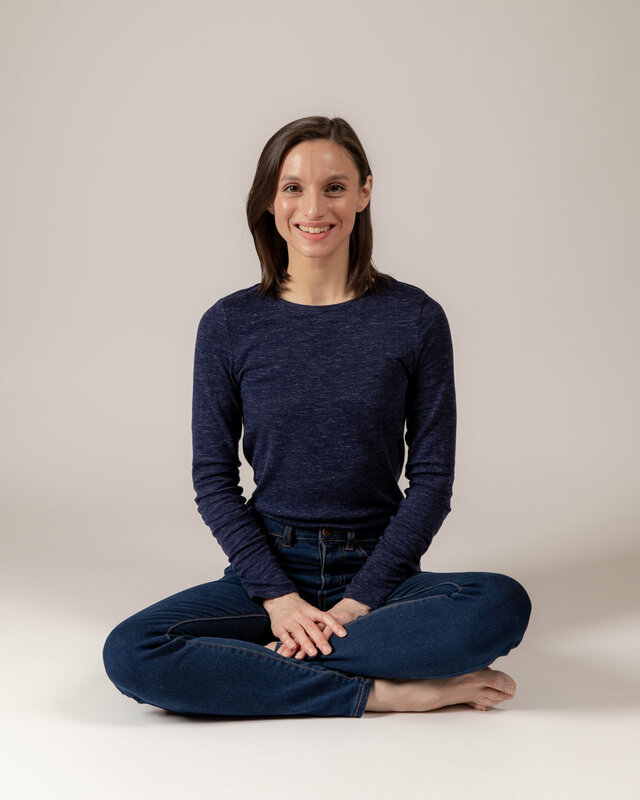 She is a senior apprentice and devoted student of David Garrigues who is one of the few teachers in the U.S. certified to teach Ashtanga yoga by the late world renowned yoga master Sri K Pattabhi Jois. She has been fortunate to study under David for the past 15 years. During this time, he has taught her Primary, Second, Advanced A Series and now the beginning of Advanced B. Shelley often travels to assists David during his in-depth studies and other trainings in the United States and Europe. Shelley started practicing yoga in 1995. In 2007 she opened Twist Yoga, which she owned and operated for 3 years before merging forces with the Spokane Yoga Shala, directing their Mysore program until the opening of AYS Spokane in November 2014. She has a B.S. in Exercise Science and completed schooling for massage practitioner. Shelley is especially grateful for her supporting and loving family; husband and favorite practice partner Brett, children Chase and Madison, and BIG beautiful Carley, their family Bernese Mountain Dog. Over the years Brett has studied with several inspirational teachers including David Garrigues and Tim Miller. In late 2014 he and his wife Shelley opened AYS Spokane. Though most of his work for AYS is behind the scenes, in 2015 he began an apprenticeship with Shelley to begin teaching in the mysore setting. He loves spending time with his beautiful wife and their two children, Chase and Madison. He works locally as an emergency physician. Karen began practicing yoga in 1996, learning the Ashtanga primary series from a book. She began teaching part time in 2001 after training with Larry Schultz at 'It's Yoga' in San Francisco. Her path over the years has included Buddhism, multiple styles of yoga, a love of climbing mountains, and an ongoing career as a school psychologist. Throughout it all the Ashtanga practice always feels like coming home to Karen. Sarah is a Washington native that grew up hiking, biking and skiing. She loves being outdoors and shares these activities with her 3 children. She started practicing Ashtanga in 2008 when her youngest child was 2 years old. She was looking for an exercise to stay healthy and instead found a daily practice that stilled her mind, nurtured her heart, and helped her discover herself. Sarah has been a licensed massage practitioner since 1999 and is an award winning visual artist with themes focusing on nature and spirit. Sarah has been a student of Shelley Enlow’s since 2008 and studies with David Garrigues as often as possible. She began teaching led classes in 2012 and in 2014 started a Mysore teaching apprenticeship with Shelley, whom she continues to work with on a daily basis. Coming from a background in dance, when Betsy discovered Ashtanga yoga she was delighted to find an activity that combined her desire for both movement and muscle. Five years ago, she was diagnosed with severe spinal stenosis, arthritis, and degenerative disk disease; while living with chronic pain is sometimes discouraging, these struggles have brought her to a patient, easeful place in her yoga practice and teaching. Betsy has been teaching yoga since 2004 and truly loves watching students transformed through their practice. She enjoys working with students of all ages and abilities and understands their physical challenges. Betsy’s goal as an instructor is that students feel safe while in class and healthy and rejuvenated afterward. In addition to teaching yoga, Betsy is an English instructor at Spokane Community College and is blessed with five fabulous children, one perfect grandson, and a wonderful husband to whom she is grateful for many things: just one of which is bringing her to her first yoga class. Yoga found Katie in a college philosophy class in 2010 which explored the concepts of evil and nonviolence through the lens of several texts including the sacred Bhagavad Gita. Although she had not yet experienced asana, she was taken with the philosophical side of yoga and yearned to deepen her study. During a break from school a year later, she took her first asana class with Shelley Enlow. That single decision to attend a yoga class set her on her course to move back to Spokane in 2014 and begin her study at Ashtanga Yoga School of Spokane. Not long afterward she began her teaching apprenticeship with Shelley, soaking up the techniques for adjusting asana and supporting students in a Mysore style environment. Katie continues to practice, study, and teach under Shelley’s daily guidance as well as the guidance of David Garrigues whenever possible.